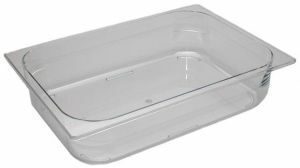 Polycarbonate trasparent container. High quality professional. Compliant with the strictest European standards. Suitable for most of the ice cream display on the market (excluding the cover, sold separately). Made in Italy.